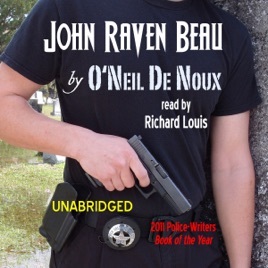 John Raven Beau (2011) is a hardboiled police novel. First book in an open-ended series, this novel was named 2011 Best Police Book of the Year by police.writers.com. Before Katrina - New Orleans is the murder capital of America and her troubled streets give rise to a cop who hunts killers with methodical, calculating precision, innate in a man half-Cajun and half-Sioux. While others lose their heads in the maddening hunt for a cop-killer, Homicide Detective John Raven Beau focuses his instincts in the relentless pursuit of a murderer. When another police officer is killed, it is obvious - someone is ambushing police officers and a desperate search for the killer grips the department. While others are ripped in the frenzy, Beau remains the cold, calculating pursuer. He will track the killers across miles of dark streets, through swamps, wastelands, over rivers and bayous. He will never give up. And he's an excellent marksman who also carries an obsidian hunting knife. Born in New Orleans, O'Neil De Noux is a prolific American writer of novels and short stories. Much of his fiction falls under the mystery genre described by critics as hyper-realistic, character-driven crime fiction. He has 30 books in print and over 300 short story sales in multiple genres. Mr. De Noux's writing has received numerous awards, including the prestigious Shamus Award for Best Short Story (Shamus Awards are given annually to recognize outstanding achievement in private eye fiction) and the Derringer Award for Best Novelette (Derringer Awards are given annually by the Short Mystery Fiction Society to recognize excellence in the short mystery fiction form).